Let me begin by thanking the High Commission here, and the Consuls in Sydney and Melbourne, for inviting me to Australia and hosting my programme. I should also thank all those, in particular the Sri Lankans, Burghers and Muslims and Sinhalese and Tamils, who have come to meet me. I am the more appreciative of this because, given distances between places in your towns, and the weather, I think getting out for such meetings requires considerable effort. As indeed emigration did, for many of you, over the years. And one wonders why, as the English said of the Scottish many years ago, so many people thought the best thing about Sri Lanka was the way out. This is absurd, given the potential of Sri Lanka, and its beauty, the greatest compass of natural beauty in such a small space in the world – but the fact remains that we closed down opportunities for our people, especially our young people, over the years. I do not think this was deliberate. It was part of what seemed an intellectual consensus at the time Sri Lanka got independence, the notion that equality was one of the greatest goods available, that this had to be achieved through the state, and that leveling downward was the best way of achieving equality. I believe that this was not wickedness, but it was certainly insensitive, and it allowed people to concentrate on those they considered the most deprived, often translated into those they saw as their particular clients in the first past the post Westminster style political system we had. This I think explains two actions that had far-reaching negative consequences. The first was the declaration of Sinhala as the only official language of Sri Lanka. It could be argued that this was no different from what has been done in other countries such as Malaysia or Indonesia, but it was done suddenly, and imposed on top of an education system that had entrenched monolingualism in our different communities. That had been done in the forties, when the principle of education in the mother tongue was made compulsory. There was a measure of egalitarianism in this, Sinhalese to be educated in Sinhalese, Tamils in Tamil, but the result was generations unable to communicate with each other, with no serious effort to ensure knowledge of the other language, or of English as a link language. 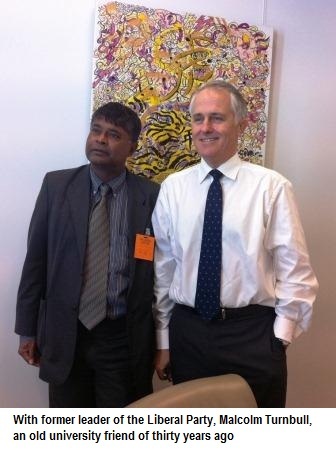 This in turn had appalling consequences with regard to employment, after Sinhala was made the only official language, and with regard to dealings with the public service, when monolinguals in one language had to seek support from those who were monolingual in another language. Similarly, when standardization was introduced in 1972, the consequences were negative for many. In theory positive discrimination is an acceptable practice, and at that time certainly it was not racially oriented, since Tamils from hitherto underprivileged areas, the Eastern Province, the Wanni, the Hill Country, benefited as much as Sinhalese from such areas in the South. But the areas that were hardest hit were Colombo and Jaffna and, whereas the youngsters of Colombo had alternative opportunities, in particular a relatively prosperous private sector, other professional qualifications, easier access to foreign qualifications, the bright students of Jaffna had no such compensations. And then, when in 1979, after standardization had been abolished in 1977, it was reintroduced in another guise, the rationale was racially oriented, in response to false claims by Cyril Mathew, who did so much to destroy Sri Lanka over several decades. These problems however could have been corrected and, though it took a long time for this to happen, action has now been taken, with Tamil having been made an official language in 1987, the introduction of compulsory bilingualism in the school system in the nineties, the recent regulations that make knowledge of the other official language mandatory for new recruits to the public sector. Much more however needs to be done, and that is why we are also reforming our education system, encouraging private institutions and input into tertiary education and skills training, strengthening the English medium option that was introduced in 2001, promoting opportunities for youngsters to meet and realize that they have much more in common than they had hitherto thought. But much more requires to be done, and I hope that those of you who did benefit from our education system when it was comparatively good will assist in the process. You can contribute to educational exchanges, to endowing scholarships at your old schools, to supporting training for youngsters who were deprived, in particular the former combatants who, in particular those from the Wanni, had to abandon schooling early when they were conscripted. Another area in which reform has begun, but needs to be fast forwarded, is that of recruitment to the public sector, and in particular to the security forces. It is often ignored that minorities continue to occupy high positions in the armed forces, and in particular in training establishments where they were relatively safe from the particular animosity against them evinced by the LTTE, but certainly in the last few years recruitment has been less. 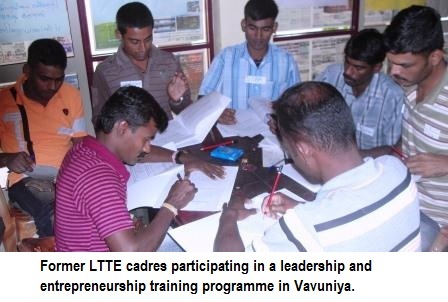 With regard to the military, security considerations were involved, including the targeting by the LTTE of Tamil speaking officers, even during the so-called Ceasefire Agreement period, but there was still continuing recruitment in some areas, including to the Cadet Corps, for education as well as cadet training. The police continued to recruit from all communities at all levels, and at the height of the war 700 odd officers passed out from the Training School at Kallady in the East. 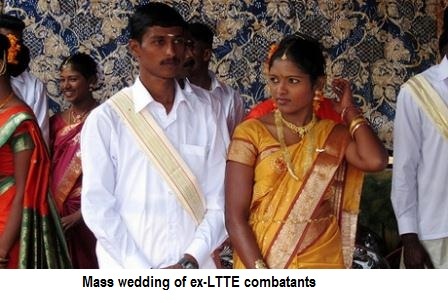 However, applications were few, given fear of the LTTE. Fortunately this changed after the LTTE in Sri Lanka was destroyed, and a few thousand applied, and a couple of batches of several hundred each have now been trained, and appointed, in particular to stations in the North. With regard to the public sector in general, we believe there will be greater interest now that the threats that confronted so many bright youngsters in the past have been eliminated. I can only hope that efforts to resurrect the LTTE abroad, and to continue to argue for separatism, will not blight the ready willingness of youngsters in Sri Lanka, from the North as well as the East, to take their proper role in the government sector. However, we need also to recognize that the orthodoxies of the sixties and seventies, when statist socialism reduced the size of the pie – so that everyone’s share, if increasingly equal, was decreasing in actual content, as John Rawls so tellingly put it in his ‘Theory of Justice’ – have given way to an almost universal understanding that the engine of growth and development needs to be the private sector. Though the excesses and the insensitivities of the crony capitalism that was the alternative, in much of Asia, to statist socialism in the seventies must be avoided, and we must continue with and develop the services that ensure equality of opportunity, education and health and infrastructure and utilities, we need also to ensure much more initiative, much more investment, much more support for entrepreneurship. In this regard, I would like to mention an initiative undertaken with part of my decentralized budget. I have a particular concern for the former combatants, who were so brutally abused, but who have within a short period seemed to adjust, into the bright and energetic youngsters they would have been if not forced into combat by the LTTE. I had wanted to start a Primary English Training programme for the girls but, by the time I got my funds, all the girls had been released. The Commissioner General requested instead that some of the funds be used for a training programme in psycho-social care, with some of the former combatants being trained to use such skills in the Wanni area. That programme, conducted by a body based in London, including expatriate Sri Lankans, was concluded successfully, and sufficient funding has now been secured for a follow up. But I also wanted some skills training, and we decided therefore on an entrepreneurship development programme. This was an eye-opener. Over a hundred former combatants applied, and thirty were selected, and proved extremely enterprising. You can see some details of the event, including the very heartening thank you speeches, on the Reconciliation Website, www.peaceinsrilanka.org – the very first articles on the home page, for which you have to scroll all the way down, since that was what I used first when I revived this website. But what also impressed me was the conceptualization skills. Asked to suggest areas in which enterprises could be set up, two groups chose agri-business, the two others construction. This fits in well with what government has been planning, to make a much better and productive place of the Wanni, neglected for so long by successive Central governments, by the much more advanced entrepreneurs and educationists of Jaffna, and most shamefully by the LTTE who prospered there and did not permit modernization, advanced education or better services despite the funds pouring in from 2002 onward. The area is incredibly fertile and, with the irrigation schemes now being developed, it will provide abundant harvests. Indeed, even at the height of the war, the paddy harvest was excellent, and government actually purchased stocks from the area for distribution to the displaced, even though we knew that the LTTE would commandeer much of the payment. We need however to ensure that the inhabitants of the area benefit from their labour, and not middlemen. To promote food processing and added value products is essential, and we believe the youngsters there can take on the challenge. But it would be helpful if they could be provided with start up funds, and I hope some of you will think of collecting funds for micro-credit schemes for the area. With regard to construction, it must be obvious that, with the rebuilding going on, there are great opportunities for workers as well as suppliers. Unfortunately much of this now benefits people from elsewhere, but it will not take much to build on the vocational training sytems already started, while also developing management and accounting skills. In the short term, as well as in the long run, empowering the people of the area to participate actively in development is the only way of ensuring an equitable share of the prosperity the whole country should be moving towards, now that the terrorist threat, which blighted the Wanni in particular, has been removed. I believe government has done extremely well thus far in the resettlement process, and in providing basic infrastructure, including schools, roads, water and electricity and better communications. It has also restored the local administration, led by extremely experienced Government Agents, some of whom did a superb job even while they had to work in areas controlled by the LTTE before 2009. The lady who ran Mullaitivu and supervised the distribution of supplies till just a few months before the conflict ended, is now in charge of Jaffna. One of her greatest achievements, it should be noted, was in conducting the national Ordinary Level Examination in December 2008, for the children too of those the LTTE had forced into going along with them in their retreat from the Western part of the Wanni. 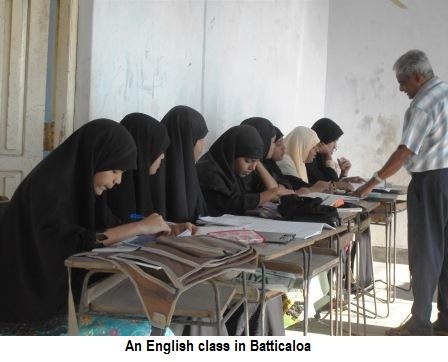 The LTTE asked that the examination be boycotted, but the people did not give in and, after some sporadic efforts at violent prevention, their will prevailed. The gentleman who looked after Kilinochchi, and kept all services going right upto the time our forces took over the town, with hardly any civilian casualties, now heads the Secretariat in Mannar. 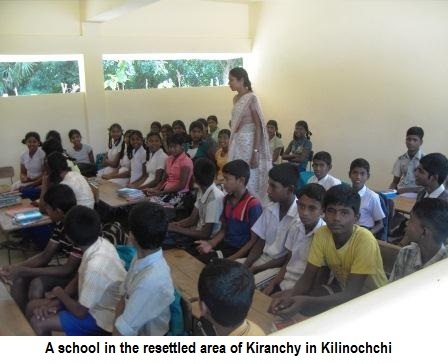 The lady who was in charge of Vavuniya right through the period of conflict and displacement is still there, and ably developing new initiatives, while Kilinochchi is looked after by the first senior member of the Administrative Service born and bred in that area. 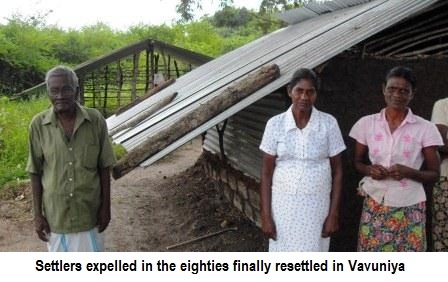 In Mullaitivu we have someone who previously worked in Mannar during the conflict, with first hand experience of the problems faces by the displaced. However, while appreciating the work of these senior officials, we can do much better in developing human resources more comprehensively. With regard to the public sector this is true not only of the North, since the second and third layers of administrators nationwide, given the decline in communication skills and decision making capacities, are not as capable yet as the senior officials mentioned above. But we need too to develop local community leaders, and mechanisms for ensuring that the schools for instance have teachers as well as equipment, that in addition to the main hospitals we have midwives and social workers and child care officials to fill up the cadre positions that are now empty. Proper training, better deployment and more efficient monitoring are essential to ensure that all areas have proper access to services that are essential. And, while affirming that government is responsible for ensuring the provision of such services, we need to develop private public partnerships to facilitate more effective delivery, whilst also developing simpler and more accessible structures of both responsibility and accountability. In the ongoing negotiations with Tamil political parties, we should also discuss the establishment of better structures at all levels, so as to ensure empowerment of the people, on whose behalf government functions. For too long now our debates have concentrated on the balance of power between politicians from different areas, whereas we should also be thinking of how power can be exercised effectively, with transparency and accountability. For too long now, accountability has been to institutions dominated by those who need to account. In place of the confrontational politics of the last couple of decades, we need to develop structures that enhance bipartisan approaches to monitoring and policy development, even though decision making rests in the hands of those elected for the purpose. We have made a start on this with the much more healthy relationship between parties on the Standing Committees of Parliament, as I can testify with regard to the Committees on Public Enterprises and on Standing Orders on which I serve. We are also trying to strengthen the role of the Consultative Committees, and it is good to see members of all parties actively involved in at least some of these Committees and the positive approaches of the Ministers concerned when problems are raised. I am pleased too that Government has now produced proposals with regard to a Second Chamber based on equal representation for Districts or Provinces. Though this is not a substitute for developing more effective structures on the ground to ensure the empowerment of people with regard to matters that affect them closely, it is also important to ensure a stronger voice for the periphery at matters that will be decided at the Centre. All parties agree that security matters, including financial and food security, need to be entrusted to a Central government, and it was a pity that previously there was no interest in ensuring greater participation of other interests in decision making in these areas. Active involvement of all segments of society in policy issues and decisions is essential, and it is a welcome advance that this too is now recognized on all sides. It is also important to entrench rights as well as responsibilities and to ensure public awareness of the basic principles on which government and society should operate. At the Ministry of Disaster Management and Human Rights, we developed a Human Rights Action Plan, which was near finalization at the end of 2009. Unfortunately, with a series of elections, this was held up and then, with the assumption that Human Rights could be steered by the Foreign Ministry, some priorities were forgotten. However the matter was entrusted to the Attorney General, who steered the principle through Cabinet last August, so that we were able to have final consultations with civil society and the officials who formed the steering committee. The final draft was then prepared by a special consultant, and it should have been put to Cabinet this month. Perhaps even more importantly, our Ministry was able in 2009 to get a draft of a Bill of Rights, as the President had pledged in his 2005 manifesto. That too was put on hold during the election period but, with the Action Plan recommending a dedicated agency for Human Rights, I hope that the Bill too can be finalized by that Agency and, after going before Cabinet, be entrenched soon in the Constitution. But, apart from fulfilling these pledges which our Ministry managed to advance significantly even during the conflict period, it is also imperative that Government puts in place better communication strategies, in particular to convey information to, and respond to the concerns of, those who are not intrinsically supportive of Government. Much energy is expended on communicating with those who are appreciative of what is being done, and this is important since no Government should neglect those from whom it derives its strength. But it is more important to communicate also with those who have doubts, and in this area Government has much to do. Distinguished academics, including Australians, who have actually studied the situation on the ground have told us that we have a good story to tell, but we have not told it. After all, where else have nearly all the displaced been resettled so soon? This includes not only the near 300,000 displaced during the last few months of the conflict, but the larger numbers who had previously been displaced, those in the East being largely resettled within a year of displacement, those who had been displaced for upto two decades being also able now to return home if they wish, including the Muslims expelled from the North in 1990 by the LTTE. The child soldiers who were finally rescued, after years of ineffective efforts to stop this ghastly practice of the LTTE, were given schooling in one of the best schools in Colombo. Orphans have been looked after in established as well as newly constructed institutions, as also by schools that have taken on the challenge successfully – in which regard I should note that support for such schools would always be welcome, along with support to educational institutions in the North that would like to expand the services they provide, to take in more of the Wanni too. Infrastructure has been developed apace, and the East indeed has been transformed in the last couple of years with communications having opened the way to much more trade. More work in this regard remains to be done in the North but, with the rebuilding of roads and the railway, there will be greater exchange of persons as well as of goods. In this regard support for increasing exchanges between young persons would also be welcome. I was pleased that one of the Australian journalists who interviewed me, having begun with what seemed a hostile approach, said at the end that there were many matters which were not known here. In one sense that is understandable, because the media obviously prefers bad news to good, since that is what people are interested in. But I believe it is also our fault that we have not communicated better, not only to the media, but also to all those who want a better Sri Lanka for all our people. As I said at the beginning, I can understand why so many people left our shores, not only for economic reasons in the seventies, but more worryingly for what I can only describe as the disgusting attacks on Tamils in the early eighties, the burning of the Jaffna Public Library in 1981, the systematic assaults of July 1983. Those have not been repeated, but I can understand that, in the confrontational approach those brutalities engendered, heightened by the refusal of the LTTE to accept in 1987 the compromises that all other Tamil groups subscribed to, tensions continued. But, now that these have concluded within Sri Lanka, I hope that those abroad, who can remember only the distant past, will not endeavour to revive tensions. 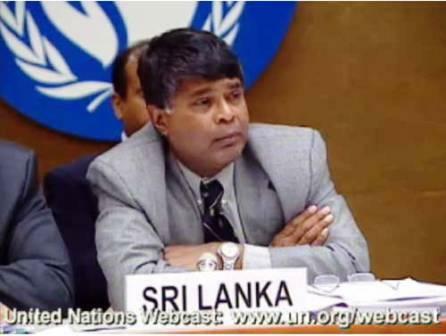 The people of Sri Lanka, all over the country, but in particular those in the North, suffered from terrorism, from forced conscription of children, from execution for dissent, from deprivation of services including the food we sent up to them. Though the ICRC recorded its appreciation of the support our navy extended with regard to evacuation, it should be noted that of the near 14,000 people brought down during the conflict, only 4,500 were wounded. There were a couple of thousand who were sick, while over 7,000 were described by the ICRC as bystanders. If the claims the LTTE made as to injured were accurate, it would seem that they did not send down some of the wounded for medical assistance, but instead sent down their chosen bystanders to safety. It is likely that they were in fact lying about the number of those wounded, which would in turn mean that they had not just exaggerated, but grossly exaggerated, the number of those dead. But, given the way they treated the people of the Wanni, it is also possible that they deprived them of medical assistance and instead sent down their cadres to the relative safety of the south of Sri Lanka. Such matters need to be carefully considered, with precise attention to the statistics maintained by various agencies, international as well as national. That will help in making clear the generally humane way in which government operated, as is evident from the written appreciations sent by the heads of both the UN and the ICRC. We need to do this soon, so that those who are genuinely concerned about the Tamil people in Sri Lanka will be able to understand what they went through, and help to recompense them for what they suffered in a militarized situation. But above all we need to make it clear that the participation of all our citizens, including those now settled abroad, will prove invaluable in the reconciliation, the rehabilitation and the rebuilding that we need swiftly to achieve.